The V40 Thinq focuses on soft colors and silky material for a better experience. We'll get our hands on the LG V40 ThinQ October 3rd, but in Korea the company has partially lifted the curtain on its latest V-series phone. While the line has grown more conventional since the release of the V10 a few years ago, this one separates itself from the pack by bringing the previously-rumored five cameras -- three in the back and two up front. While this announcement didn't include detailed specs about the CPU or those cameras, LG confirmed there's a 6.4-inch display, and instead focused on the feel of its reinforced glass frame. Combined with a slim and light design that is just as wide as last year's V30 but has a smaller bezel, LG claims it combines to make a phone that's easier and more comfortable to use with one hand. 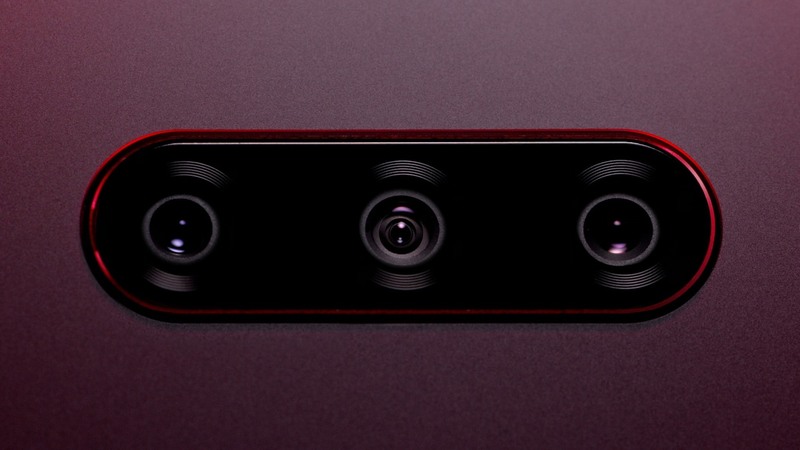 The LG V40 Thinq's rear triple-camera setup. These pictures and video clip don't show the front, but flash and laser depth sensors are apparently mounted inside the phone and are flush with its surface to also help with comfort. A tweet from Evan Blass earlier today does show off the front of an AT&T-branded V40, which makes clear just how thin those side bezels are and where the notchless (update: nope, there's a notch) front hosts its dual-camera setup. For more information, you may have to wait until next week.